Playing catch-up but worth the wait? Intel chips are set to come to the smartphone market in 2012, but the company isn't worried about being last to the party. 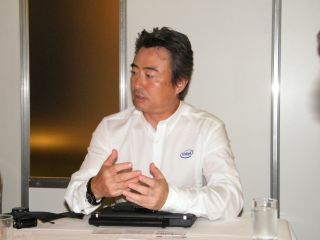 Speaking to TechRadar at CEATEC 2011, Kas Yoshida, president of Intel Japan, said that despite taking its time entering the smartphone market, it will offer up a better performance than its rivals. "We want to be number one for performance," explained Yoshida. "There is more and more demand for apps that need performance, so we need to be good at that but we still need to catch-up with the Android eco-system." As well as its alliance with Google – back in September it was announced that Google will be optimised for Intel chips – Intel also believes that the next generation of Symbian phone Tizen OS, will present an opportunity to show just what Intel is capable of in the phone market. "Tizen is part of our phone roadmap. We always believe in an open environment and we encourage the software industry to thrive in this environment." Although we asked when we will see Tizen phones hit the shelves – considering the problems Intel had with MeeGo – Yoshida didn't give much away but hinted: "Tizen products are not fixed yet be we hope to offer something soon."